Water Treatment: Equipment, Systems, Technologies, etc. Does your facility need an industrial water treatment system? Keep your facility running optimally with the proper, custom-engineered industrial water treatment system. If there is one part of the process you can focus on to immediately see results, it’s the proper treatment of your process water. Without the right integration of process water treatment and purification technologies, you risk scaling on pipes and the fouling of expensive equipment, increased organic growth, high total dissolved solids, and a host of other problems that affect the quality of your product and service life of your equipment. A proper industrial water treatment system will treat your facility’s water so it is more appropriate for a given use, whether for consumption, manufacturing, or even disposal. That said, each system will vary depending on the facility’s needs and many of the technologies that make up these systems can be similar. Clarification; a multistep process used to remove suspended solids from a solution. Lime softening; a process involving the application of lime or lime soda to raise the pH of the stream, which in turn encourages mineral constituents to precipitate out of solution. Ion exchange (IX); a treatment process where dissolved ions are replaced by other, more desirable, ions of a similar electrical charge. Filtration; membrane filtration units can be a cost-effective means of preventing fouling and excess maintenance of downstream equipment. Polishing; typical polishing technologies include mixed bed deionization (DI), electrodeionization (EDI), or offsite regenerable DI. Special processes; some streams can be complex and highly variable from one facility to the next, so special processes can assist with treatment needs. 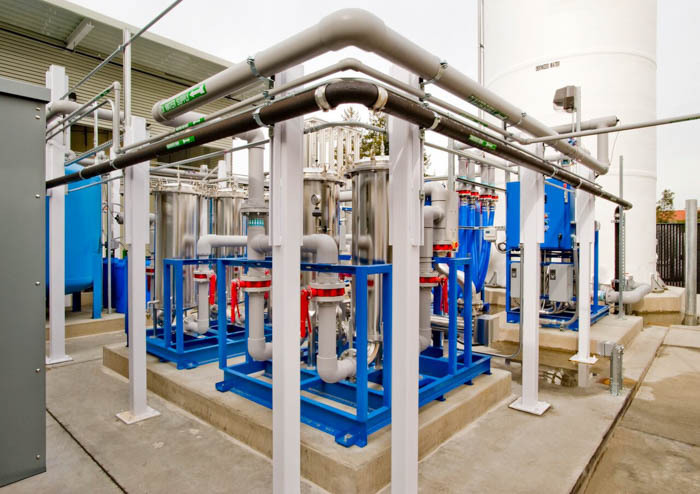 How do you choose the best industrial water treatment system technologies for your plant? What are the common industrial water treatment system issues and how can you fix them? Does our plant need an industrial water treatment system? Contact SAMCO today for more information on our custom-engineered process water treatment solutions, and see how we can help you increase your plant efficiency, improve the effectiveness of your machinery, and meet your stringent feed water and wastewater specifications. We’ve been helping companies like yours effectively treat their process water for over 40 years and likely have a solution for you.